The 2015 Chevrolet Silverado 1500 and the Toyota Tundra are two of the most capable, powerful full-size trucks on the road. Drivers love them for their massive towing and hauling capabilities. Inside, these modern pickups offer upscale cabins and high-tech features. Shoppers can choose from a wide range of configurations to create the truck that suits their individual requirements. If you're shopping this segment, read our four-category comparison to decide which model is right for you. The 2015 Chevrolet Silverado 1500 is our pick in this all-important category. All Silverado models can be equipped with either rear- or four-wheel drive. With the standard 4.3-liter V6 engine, drivers have access to 285 horsepower and 305 pound-feet of torque. Depending on body style, the V6 Silverado can tow maximum loads ranging from 5,500 to 7,600. For greater power, a 5.3-liter V8 is standard for the upscale LTZ and optional for other Silverado 1500 models. It produces a substantial 355 horses and 383 pound-feet of torque. High Country and LTZ shoppers can choose an additional option, the 6.2-liter V8 engine. With it, the Silverado 1500 uses 420 horses and 460 pound-feet of torque to tow loads of up to 9,100 and 12,000 pounds. The 2015 Toyota Tundra isn't far behind in terms of power. Shoppers can choose between two engines. A 5.7-liter V8 makes 381 horses and 401 pound-feet of torque. A 4.6-liter V8 generates 310 horses and 327 pound-feet of torque. With the more powerful 5.7-liter engine, certain Tundra models can tow a maximum load of 10,500 pounds. 2015 Chevrolet Silverado 1500 shoppers can choose from a long list of options to create the perfect pickup truck. To start, there are three body styles: regular cab, extended Double cab, and crew cab. The regular cab can be paired with either the standard 6.5-foot or the 8.2-foot bed. Extended cabs are fitted to a 6.5-foot bed. Crew cab shoppers can choose between the 5.75-foot short bed and the 6.5-foot standard bed. Finally, the Silverado 1500 is available as six trim models, the basic Work Truck, midlevel LS, and luxurious LT, upscale LTZ, plush High Country, and off-road-ready Z71. The 2015 Toyota Tundra offers similar configurations, with three cabs (regular, double, CrewMax), and three available bed lengths (5.5 feet, 6.5 feet, and 8.1 feet). Shoppers can choose from a wide range of trim models: SR, SR5, Limited, Platinum, and the 1794 Edition. 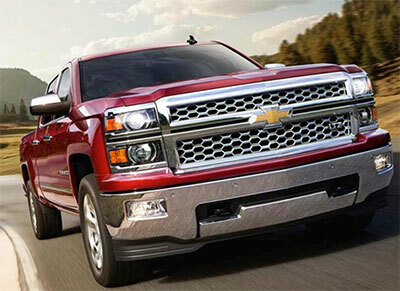 The modern 2015 Chevrolet Silverado1500 is the easy pick for safety, thanks to its wide range of high-tech equipment. Its standard OnStar telematics system helps drivers out of tough situations with features like automatic crash notification. An available rearview camera improves rear visibility. Safety systems like forward collision alert heighten driver vigilance. In government crash tests, the Silverado earned a perfect five-star score for overall crash protection. The 2015 Toyota Tundra has some high-tech safety features of its own. The Platinum model comes with front and rear parking sensors, helping drivers glide in and out of tight spaces. The Tundra comes standard with a rearview camera. We like the 2015 Chevrolet Silverado's long list of modern conveniences. Standard equipment includes a 4G LTE Wi-Fi connection that transforms this pickup into a mobile hotspot. The midlevel LS comes with an upgraded MyLink infotainment system, allowing users to interact with a wide range of apps on a 4.2-inch color display. The 2015 Toyota Tundra competes well in this category. The Entune Audio system is standard, along with its 6.1-inch touchscreen. The Limited adds a standard navigation and app suite, equipping drivers with vital information. It was a close race, but the 2015 Chevrolet Silverado 1500 finishes ahead of the Toyota Tundra. On the road, its powerful engine lineup delivers incredible towing and hauling capabilities. Inside, both driver and passenger can expect comfort and convenience. High-tech safety equipment helps protect the Silverado. Finally, a wide range of configurations means shoppers can tailor the Silverado to suit their individual needs.